The strange legal case pitting high-stakes American poker pro Gordon Vayo and global online-poker market leader may have reached its legal conclusion, with PokerStars agreeing to drop its claims of at least $280,000 against Vayo in exchange for Vayo amending his earlier voluntary dismissal of his own claims against PokerStars, such that Vayo can never again sue PokerStars or its corporate parent, Rational Entertainment Enterprises Limited (REEL), over the matters at the heart of the case. For those somehow just checking in on the tale, Vayo, best known as the runner-up in the 2017 WSOP Main Event, sued Stars and REEL in May over nearly $700,000 in winning that had been frozen by PokerStars. While doing a security and compliance check on Vayo’s connection to PokerStars’ site during the May 2017 Spring Championship of Online Poker (SCOOP), Stars uncovered evidence that Vayo had likely been playing from California (US) — a banned jurisdiction where PokerStars does not offer service — instead of from Canada, as Vayo had claimed. Early on, before filing his lawsuit, Vayo complied with a PokerStars request to provide some proof of his presence in Canada during the timeframe of the May 2017 SCOOP event where he cashed for over $690,000. Then, in October, the whole matter turned sideways when an a tipster voluntarily provided information to PokerStars that the bank and utility statements Vayo had submitted were forgeries; the tipster was also able to provide copies of the original statements, which laid bare Vayo’s fraudulent claims. 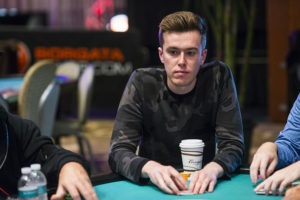 Vayo’s initial attorney quickly dumped him and seems to have urged him to drop the matter, which PokerStars’ California attorney advised him to do. On behalf of PokerStars and REEL, that attorney also offered not to pursue counter-damages against Vayo if Vayo agreed to drop the matter “with prejudice”, meaning he would be barred from re-filing the claim. For whatever reason, that didn’t happen; Vayo dropped the initial lawsuit without prejudice, even as he hired a new attorney to potentially deal with the fallout from the forged-documents discovery. This in turn forced REEL to file that claim for the $280,000 (likely plus tens of thousands more), with a mid-December court hearing about the damages claim on tap. Perhaps Vayo rethought the matter in the few weeks that elapsed between REEL’s filing for damages, or perhaps he just took the likely legal advice to accept whatever deal REEL and PokerStars offered just to stay out of a courtroom proceeding. 1. This action is hereby dismissed with prejudice by Plaintiff Gordon Vayo. 2. The pending Motion for Attorneys’ Fees and Costs by Rational Entertainment Enterprises Limited d/b/a PokerStars [Dkt. No. 37] is hereby withdrawn without prejudice. The notice was signed by the counsel for both sides. PokerStars’ withdrawing of its claims “without prejudice” allows it to refile a claim for that $280,000 in damages in the event some further unexpected development in the matter occurs. Does this strange story end here? Probably, though the highly visible fraud attempt by the 30-year-old Vayo could attract attention from California or US federal authorities. Vayo may also have caused collateral damages to others, notably his own first attorney in the case. In any event, Vayo was exposed by all of this as a cheat and a fraud. It may not affect his ability to continue to play poker — except online at PokerStars, where he’s likely persona non grata for eternity — yet Vayo’s personal brand has been damaged perhaps beyond repair. Perhaps Vayo thought that playing from the US illicitly via a virtual private network (VPN) was a freeroll of sorts, and that even if he was caught, he’d get his entire bankroll back. Instead, as happens in these cases, the money forfeited from Vayo’s Stars account will be distributed to worthy charitable causes. And yet, except for Stars’ good graces in dropping the counter-damages claim, the total hit to Vayo could have been even worse.